Of the 30 teams that make up the NHL, 11 teams — about a third of them — have never won the Stanley Cup. Of the six teams who have skated, and lost, two teams stand out because they’ve flirted with Lord Stanley’s Cup three times. Those teams are the St. Louis Blues, and the Vancouver Canucks. They’ve been always bridesmaids, but never the brides. With an average age approaching 29, the Blue’s first season ever would have amounted to little except for the way the NHL had structured the divisions and the playoffs. That’s because the six expansion teams were put into a division of their own, where they played 50 of the 74 regular season games against each other and only 24 against the original six. When the regular season came to a close, the top four teams from both divisions battled it out to determine who would represent the division for the Stanley Cup. The first place team played against the third place team while the second place team played against the fourth. The winners of each series played against each other and the winner of that contest would play in the finals, for the Stanley Cup. The Blues, ending the season in 3rd place, beat both the Philadelphia Flyers and then Minnesota North Stars in two gritty best-of-seven series to advance to the finals against the Montreal Canadiens. The Blues lost to the Habs in 4 games straight, but that 4-0 result is no reflection of just how close the Blues really came to winning. Under the coaching leadership of first-time coach and future Hall of Famer, Scotty Bowman, the Blues lost each game by just one goal. 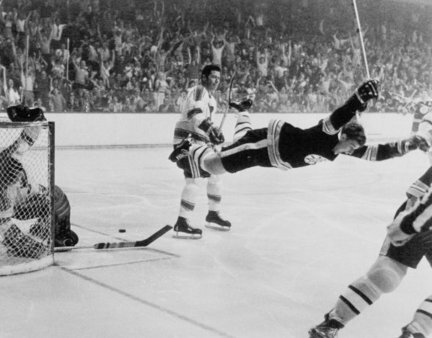 They returned to the finals in the two subsequent years, first in a repeat against the Canadiens with another 4-0 shutout but a much higher goal differential, and then in 1969-70 against the Boston Bruins where they lost, again, in 4 games to none; the final game famously recorded in hockey history forever because of Bruins’ defenceman, Bobby Orr’s, flying goal. Since the Blue’s 3rd season, although they’ve made the playoffs in all but eight times, but they’ve only made it past the second round once, in 2001. Their playoff results from the last two years were especially painful, being eliminated from the series after the first round. Worse yet, they’re coming close to trademarking an end-of-season pattern of losing – both on the road and at home at the Scottrade Center — a déja vu that’s becoming repetitive, disappointing and upsetting to their fanbase. But at least their fans don’t riot. For the Canucks, who joined the NHL in 1970, the last time the Cup was in their sights was their 3rd visit to the Stanley Cup finals, in 2011. Playing against the Boston Bruins in a best-of-seven, the contest went down to the wire. The President Cup’s winners — with a league leading 117 points, found it next to impossible to score against the Bruins. 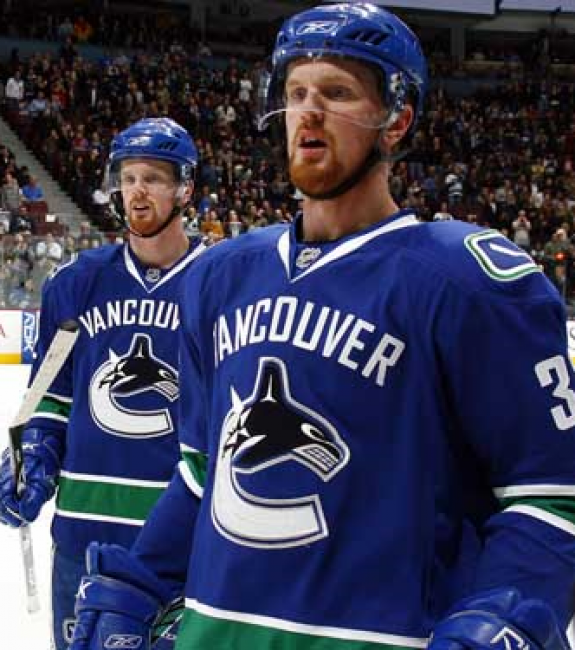 The Canucks’ best scorers throughout the regular season, forwards and brothers Henrik and Daniel Sedin, were only able to score one time each on the Bruin’s goalie, Tim Thomas. (Thomas ended up winning the coveted Vézina Trophy for goaltending excellence as well as the Conn Smythe Trophy for Most Valuable Player, voted by his teammates.) In fact Vancouver was only able to muster 8 goals in the seven games — and it takes goals to win a series. Two of the Bruins’ regular season scoring leaders, David Krejci and Patrice Bergeron, continued to find ways around the two Canucks goalies, Roberto Luongo and Corey Schneider, but Brad Marchand stepped up a notch, moving from 8th position in the regular season up to 3rd for the playoffs. The hard hitting series, where one game bagged a combined total of 143 penalty minutes, ended in Vancouver with the Bruins lifting the cup after a 4-0 shutout, and 100,000 unhappy fans took to the streets in a riot that cost in the neighbourhood of $10 million in property damage due to vandalism. The series, which pitted Vancouver Captain Trevor Linden against the Ranger’s Captain, Mark Messier, played its final game at Madison Square Garden. The Rangers got two goals up, and then Linden put one in. Messier responded with another goal, putting the Rangers up 3-1. Linden put in his second of the night with only 4 minutes left in the 3rd period. The rest of the game was nerve-wracking for both teams — and their fans, and, with one minute left to play, Vancouver center, Nathan LaFayette, had a shot that hit the post. That’s as close as Vancouver would come to tying the game. The win by the Rangers not only ended a 54-year Stanley Cup drought, but marked the first time that Russian players’ names were etched on the cup. Meanwhile, back in Vancouver, between 50-70,000 fans gathered in the downtown area and the gathering soon turned ugly. The damage was estimated at $1.1 million dollars and over 200 people were hurt. Both rosters are loaded with talent. 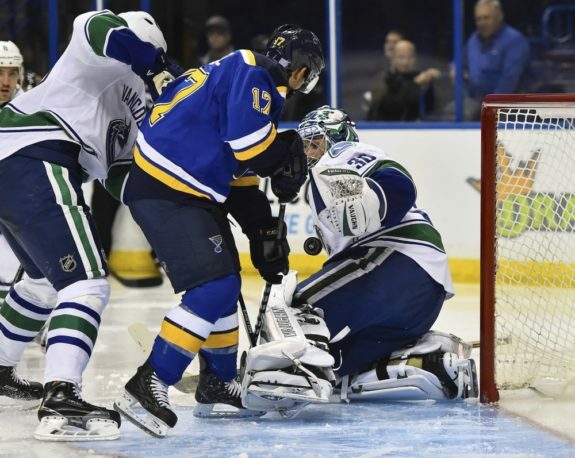 For the Blues, that talent includes 2014 Olympic overtime sniper, T.J. Oshie, top-10 scorer Vladimir Tarasenko, their Captain, David Backes, Alexander Steen, Jaden Schwartz and Alex Pietrangelo. Coached by Ken Hitchcock, he was able to motivate the Dallas Stars to their only Stanley Cup victory when he was their coach, in 1999. In the three seasons that “Hitch” has coached the Blues, they’ve made it to the playoffs every single time. For the Canucks, their talent sheet is unusually stocked with Scandinavians made up of five Swedes and one Dane. That list includes two Swedish goaltenders, Eddie Lack and Jacob Markstrom as well as veteran forwards Henrik Sedin (C) and Daniel Sedin (A). Willie Desjardins may be working as a head coach for an NHL team for the first time in his career, but he brings to Vancouver an enviable coaching pedigree, both as a WHL coach for the Medicine Hat Tigers and for the AHL’s Texas Stars. In the past 10 seasons as a head coach, Desjardins has always made the playoffs, and has converted three playoff runs into championships for his teams. Both Hitchcock and Desjardins are capable, but both of them need to find ways to make their players stop being scared of the Cup, and fight to win it. That’s something that, for both teams, seem to be slipping away. If they can turn the tide, and give them the courage to win, both teams will have a chance at the championship. Only then will their team stop being a bridesmaid and become a Stanley Cup bride, at last.